Conner’s father had served in the Confederate Army and was blinded at the Battle of Shiloh in 1862. In spite of his father’s debilitating wounds, Conner wanted to become a soldier from a young age. He graduated from West Point in 1898 and was commissioned in the artillery. In 1907, Conner graduated from the Army Staff College at Fort Leavenworth. He then taught at the Army War College for four years, which he found “something of a strain.” However, in 1911, Conner was sent to France as an exchange officer and assigned to the French Army’s 22nd Field Artillery. This assignment proved very fortunate for Conner’s career. While in France, Conner observed the French Army in drills and met many of its officers. In addition to his military training, he also attained near proficiency in French. 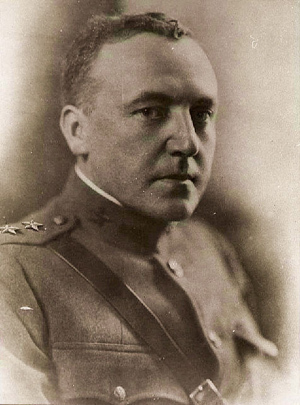 Thus, when America entered the World War I and GEN John J. Pershing was assembling his staff for the American Expeditionary Force (AEF), he immediately called on Conner and made him the assistant chief of staff for operations (G-3) for the AEF. Before Pershing and his officers boarded the S.S. Baltic on 23 May 1917 for England, they had been told to wear civilian clothes to elude German spies. Everyone complied, but Fox Conner, ever the soldier’s soldier, could not resist wearing his sword as he headed off to battle. Conner planned the Army’s artillery needs during the war. His previous duty in France proved invaluable, as U.S. manufacturers were unable to supply many guns and the Army mostly used French artillery. He was promoted to brigadier general and set about organizing the AEF. Moreover, he displayed his innate prescience, for which he later became very well known, by predicting a German offensive in the Meuse-Argonne, a relatively quiet sector of the Western Front, a year before it occurred. Conner also worked with LTC George C. Marshall, the G-3 of the 1st Infantry Division during the war, and came to view Marshall as a man and a soldier of the very highest caliber. After the war, Conner commanded the 20th Infantry Brigade in the Panama Canal Zone. In 1922, MAJ Dwight D. Eisenhower reported to Panama on Conner’s staff. Conner was an outstanding commander and mentor for Eisenhower. He inculcated a love of military history in Eisenhower which did not exist previously. He ordered Eisenhower to read von Wartenburg’s biography of Napoleon, Clauewitz’s On War (three times), Steele’s Campaigns, and many other historical classics. Conner tested Eisenhower daily on his reading, re-fought the great battles with his protégé, and scrutinized the errors made in wars in the past. Moreover, Conner instilled in Eisenhower the insightful belief that “another war was written into the Treaty of Versailles.” Eisenhower’s readings taught him the rudiments of warfare, but also instructed him in some of the finer arts of high command. Conner especially emphasized instruction in working with allies in war, which Conner thought would prove crucial in the next world war. Conner knew the Allies would have to be more coordinated than they had been in World War I; they needed a single chain of command, and such a task would require considerable diplomatic skills in addition to military acumen. After Panama, Conner served as the deputy chief of staff for the Army, commanded the Hawaiian Department and later commanded the First Corps Area. In all of his commands, Conner strove to teach and instruct his junior officers in the military disciplines. Promoted to major general in 1925, his name was often mentioned as a contender for the Army Chief of Staff position. History remains clouded on Conner’s thoughts about becoming the Chief of Staff. Eisenhower thought Conner “hated staff jobs” and would have resigned before taking the post. Others presumed that Conner was very saddened that he was not appointed to the top Army position.